Following up the tenth anniversary release of her highly praised album River Dawn - Piano Meditations, pianist Catherine Marie Carlton once again shows she has few peers when it comes to crafting album-length impressionistic piano music. Her brand new recording, River Flow - Sanctuary is as intimate a recording as you are likely to hear this year, and it aptly demonstrates that River Dawn was no fluke. As on that disc, Charlton displays an amazing control of nuance and tone, set against a backdrop of always-shifting minimalism, maintaining continuity even when the music evolves, which (as was the case on River Dawn) perfectly captures the image of a river as it wends its way through a varied countryside of hills, plains, and forests, during both sunshine and clouds. Expertly engineered and mastered by Eric Troyer, and recorded on the artist's own Steinway (according to the liner notes, the album was recorded while her family was asleep upstairs), this CD is, in some ways, a tribute to the instrument itself, as Charlton pours her musical soul into these sparse yet elegant melodies to beautiful effect - this is piano music stripped of all artifice and pretension. While there are 12 tracks listed on the album's back cover, (and some tracks offer subtle transitions from style and mood but usually after the track starts), this is, essentially a single piece of music. Re-drawing the river analogy, like a river can switch from a bubbling effervescence to lazily flowing to an almost Zen-like sensation of calm and serenity, the music here does the same, although most of the effervescence is restrained. Charlton never cuts fully loose, but keeps the music anchored in an overall mood of repose, reflection, and purposeful formlessness (if that makes sense). When occasional moments of joy, exhilaration, and excitement do occur, they seem to fit perfectly within the larger context of a sense of relaxation. 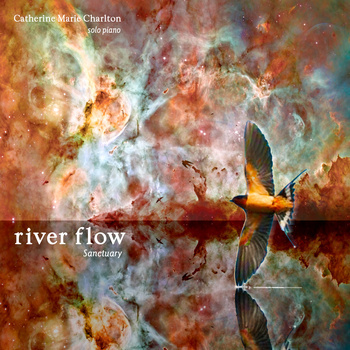 River Flow - Sanctuary is an ideal recording for quiet times, e.g. massage, reading, or late night fireside chats. Attentive listening will reveal that Charlton weaves in some repeated themes, so that a musical phrase (which may only be comprised of a series of notes) will sound familiar, more or less reassuring the listener, as if the "river" was saying to you "Just relax, I will take you where you need to go." While some tracks (such as "stars awaken") do subtly erupt with playfulness or subdued uptempo passages, the overall vibe here stays relatively constant. I was particularly enamored of the more tranquil and minimalist pieces here, such as "be still, my soul" which evoke comparison to the sound of raindrops hitting in irregular patterns on a pond's surface, a type of naturalistic randomness of piano notes, if you will. However, the last thing you should expect from River Flow - Sanctuary is an album full of pointless noodling or self-obsessed pretension. Charlton's playing is wholly organic, even when it's at its most minimal, such as early on in the CD's centerpiece, the nearly twelve minute long "learning to fly" (which later transitions into one of the recording's more lively sections before winding back down again). Graced by a beautiful cover (design and illustration by Betsy Molina Mortenson) River Flow - Sanctuary is one of my favorite piano releases of recent years. Every playing reveals something new, but also conveys a strong sense of the familiar in that it's instantly approachable, always inviting, and comforting to settle in with for an hour (or more if you hit the repeat button on your CD player). It takes an ultra-special solo piano release to ignite the kind of fire in my reviewer's soul that I felt when I first played River Flow - Sanctuary, and after five or so playings, my enthusiasm for the album has not diminished one bit. The album may evoke for you what it does in me, i.e. the wish that I could find a river such as is "described" in this music and walk along its banks, finding solitude and respite from what ails me. Until I find such a place, I will content myself with just "hearing" about it.